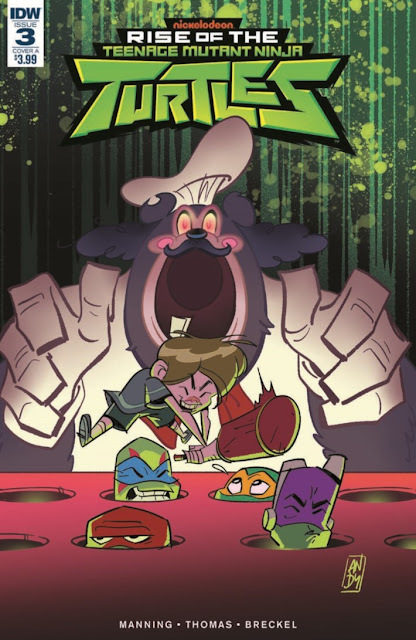 Rise of the Teenage Mutant Ninja Turtles # 3 is out this week at comic stores and digitally. As the mystery of the disappearing mutants deepens, the Turtles are faced with a threat of Chuck E. Cheese-like proportions. Chad Thomas once again outdoes himself illustrating my goofball script, with help from colorist Heather Breckel and letterer Shawn Lee. The whole crazy shebang was edited by Bobby Curnow and Megan Brown. "The TMNT are in a bitter fight with each other over an extremely sensitive topic… which pizza place has the fastest delivery! 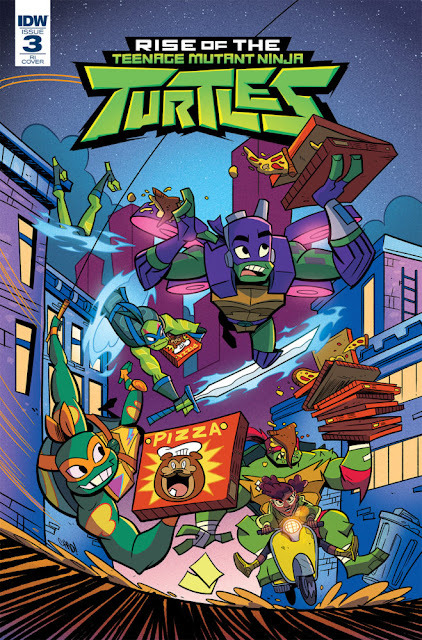 When a villain butts in, the Turtles will have to put aside their differences and do what they do best: beat up bad guys!"